Panoramic Point is a fine overlook on the edge of a cliff a couple of miles northeast of Grant Grove Village, overlooking a 30 mile section of the central Sierra Nevada including Kings Canyon and its adjacent mountains. 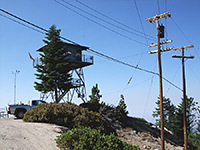 The point may be reached by a narrow, winding road that becomes unpaved and continues 2.5 miles south along a sparsely wooded ridge to another viewpoint, site of a fire lookout station. 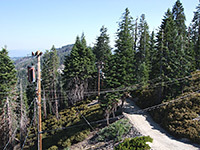 This part of the road is closed to public vehicles but open to hikers, though a rather more scenic route is provided by the Park Ridge Trail that parallels the road, running right along the crest of the ridge and so allowing more good views, both of the high Sierra and Central Valley in the west. On a clear day even the coastal mountains are visible, 100 miles away. The Generals Highway (CA 198) linking Kings Canyon and Sequoia national parks is almost completely enclosed by tall trees so the ridge is one of the few places in the area to allow unobstructed views of the valley far below. Park Ridge Trail topographic map, Grant Grove location map. 9 views along the Park Ridge Trail. Once past Grant Grove Village, the approach road is steep, narrow, and lined by trees that grow right next to the carriageway, hence the route is not recommended for RVs or trailers. It climbs 900 feet up the hillside to a good sized parking area in a clearing in the woods, from where the unpaved, gated track to the fire lookout point branches off southwards. The nearby footpath is paved at first as it ascends to Panoramic Point, situated on the edge of a steep-sided ridge a short distance east. The mountainous vista is centered on the deep gash of Kings Canyon - 2,000 feet below and 20 miles distant, beyond which are many summits of the Monarch and Great Western Divides, as far as North Palisade (35 miles). Even on a cloudless day the view is rather hazy, however, owing to the great distances. After the viewpoint, the continuation path along Park Ridge is narrower and much less used, as it follows the ridgeline southwards, initially through a wooded area. The trail climbs up a steepish slope to a minor summit then proceeds over a flat plateau where the trees open out for excellent views east and especially west, across Central Valley. The scene is often spoilt somewhat by horizontal layers of brown smog making much of the landscape indistinct, though on a clear day the Coastal Mountains are prominent, and even the Pacific Ocean can be glimpsed, 140 miles away. Vegetation alongside the mostly sunny trail includes manzanita, pine, aspen and, in early summer, a good variety of wildflowers. After 1.5 miles the path descends to the fire road, crosses to the far side and passes junctions with two trails that descend the slopes towards highway 180 (the Azalea and Manzanita trails). The last section of the Park Ridge Trail crosses a lightly wooded hill before rejoining the road shortly before it ends at the lookout point. Trees cover much of the adjacent land, blocking the views in some directions but there are no obstructions from the top of the tower, 50 feet higher. 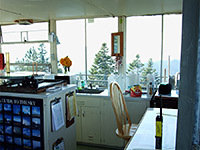 When staffed (usually from July to October), visitors may climb to the top and chat to the resident volunteer; all such fire lookouts in the state are maintained on a voluntary basis, in this region by the Forest Fire Lookout Association. The Park Ridge station has a typical design of a 15 foot square metal-framed room entirely surrounded by glass and equipped with such home comforts as a bed, stove, sink, heater, refrigerator and radio. The volunteers typically stay here for several days at a time, with contact to the outside world limited to the radio and the dozen or so hikers who use the trail each day.